Includes links to community notes. Santa Barbara Municipal Airport (SBA): The Santa Barbara Municipal Airport (SBA) is less than 2 miles from UCSB. Flights connect from Los Angeles, San Francisco, Portland, Seattle, Phoenix, and Denver. The 11 bus stops near both the airport (2 minute walk) and the Pacifica Suites hotel (2 minute walk). Regular one-way fare is $1.75. The bus runs approximately every 20-30 minutes throughout the day. The Pacifica Suites hotel also offers a shuttle from the Santa Barbara airport Monday-Friday from 9am-5pm. Please contact the hotel for more information. Los Angeles International Airport (LAX): Santa Barbara Airbus runs daily shuttles from LAX to Santa Barbara and Goleta. Amtrak stations are located in Santa Barbara (12 miles from UCSB) and Goleta (3 miles from UCSB). The Goleta Amtrak station is approximately 2 miles from the hotel. The #6 bus stops near the station (7 minute walk) and the Pacifica Suites hotel (2 minute walk). Regular one-way fare is $1.75. The bus runs approximately every 20-30 minutes throughout the day. The Pacifica Suites hotel also offers a shuttle from the Goleta Amtrak station Monday-Friday from 9am-5pm. Please contact the hotel for more information. In conjunction with HydraCamp, a limited number of rooms have been reserved at the Pacifica Suites hotel for the group rate of $169/night. To make your reservations, please call the hotel directly and request the group name "Hydra Camp at UCSB Library." Rooms are limited and the group rate is only available for bookings made before January 21, so please reserve your room promptly. 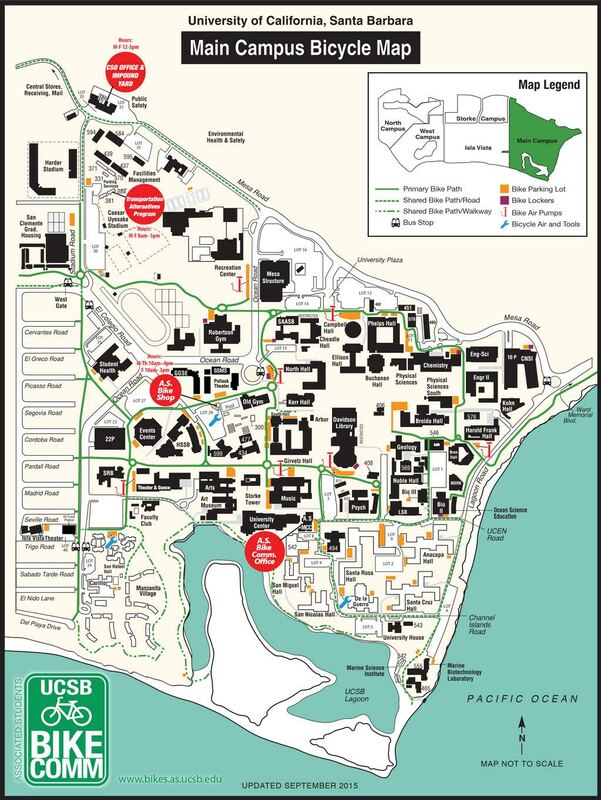 A bus stop with service to UCSB is located about a 2 minute walk from the Pacifica Suites hotel. Regular one-way fare is $1.75. The 11 bus runs approximately every 20-30 minutes throughout the day. For more information, including transportation to downtown Santa Barbara, please see the Santa Barbara MTD. Campus is an easy bike ride from the Pacifica Suites hotel (much of the route is on a bike path), and there is a bike parking lot at the library. UC Santa Barbara is one of the most bike friendly campuses in the country, and has an extensive network of bike paths and parking lots. If you are traveling to Santa Barbara via Amtrak, you can bring your bike onboard the train. Due to construction, there are detours on several of the campus bike paths. Check out the campus bike map below for for up-to-date information (Google Maps may not be accurate). Please propose a topic that you would like discussed at the meeting. This can either be something you are interested in learning more about, or something that you are willing to present and/or facilitate discussion of. If you are willing to present/facilitate, please include that in your description. You can also propose a topic by emailing Chrissy Rissmeyer at UCSB (crissmeyer@ucsb.edu) or Matt Critchlow at UCSD (MCritchlow@ucsd.edu). Your feedback will be used to shape the agenda for the day. Please indicate your interest in the proposed topics by no later than 5pm on Wednesday, February 24. Please contact Chrissy Rissmeyer at UCSB (crissmeyer@ucsb.edu) or Matt Critchlow at UCSD (MCritchlow@ucsd.edu) with any questions.